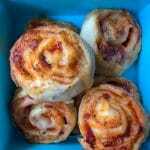 This recipe for Yogurt Dough Pizza Scrolls has been updated in April 2019 to halve the quantity of the dough and add more detail around how to make this recipe based on reader feedback. The last two weeks have been CRAZY. I have been super busy at work. And on top of this it’s been a busy time at home. I mean, it always is, but things seem more chaotic than normal. So it’s been hard to keep on top of recipe testing this last week. I like to have my blogs planned out a few weeks in advance so I am pretty much testing recipes all the time. But this week it’s been much more of a fly by the seat of my pants week. So I am soooo grateful I remembered these easy Yogurt Dough Pizza Scrolls that we had made a lot in the past but not so much recently! If you haven’t heard about two ingredient yogurt dough yet I would be entirely surprised. It’s a super easy way to make dough. And it’s really versatile. And one of our family’s favourite ways to enjoy yogurt dough is these Yogurt Dough Pizza Scrolls. 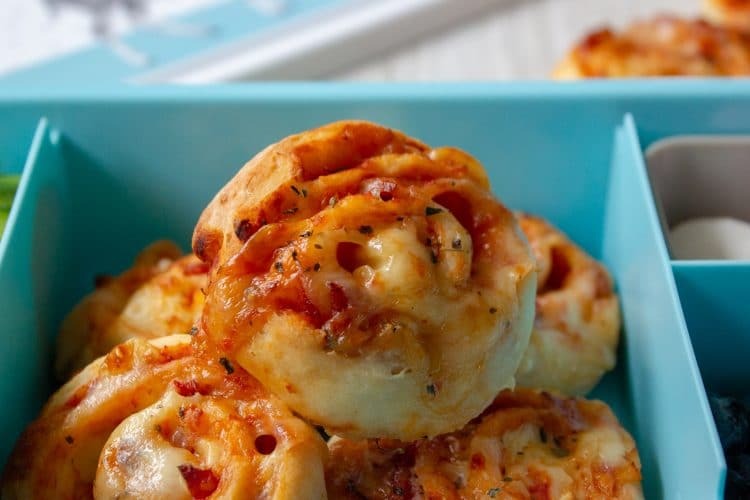 Pizza scrolls are a fun option for the lunchbox instead of a sandwich. The key to making these Yogurt Dough Pizza Scrolls is to have a light hand with the fillings so they stay together when cooking. I also make these on a sheet of waxed baking paper. This will help when rolling the scrolls. If your baking paper is unwaxed be sure to grease it lightly. These delicious Yogurt Dough Pizza Scrolls are fantastic for school lunches instead of a sandwich. In a bowl add the greek yogurt and stir around a little. Add in 1 cup of self raising flour and mix together until a dough forms and smooth into a ball, it will be a little sticky at this point. Leave the dough in the bowl and continue to add the extra flour slowly as required (I find just over 1/4 cup is necessary but you may need more) kneading until the dough is workable, smooth to touch and is no longer sticky. This process will take around 5 minutes. Turn out the dough onto a piece of waxed baking paper. If your paper is not waxed then lightly spray with cooking oil. This will ensure the dough does not stick to the paper. Place the dough on the paper and quickly shape into a rectangle with your hands. With a floured rolling pin, roll out until the dough is about 1.5 cm thick. Try to work through this step quickly. Quickly and gently roll the dough up evenly from the shortest side to form a log then slice each log into 8 even scrolls. This dough can be sticky so take care with how you measure the flour and Greek Yogurt. I measure the greek yogurt by spooning it in the measuring cup. I measure the flour by scooping it from the container and ensuring the flour is tightly packed (for this recipe only – do not measure flour like this in my other recipes). Spend some time mixing the dough in the bowl, using a spoon until the dough is workable with your hands. You can add in additional flour if you feel it is too sticky but around 1/4 cup of flour (measured so it is tightly packed) should be sufficient. It’s important to have waxed baking paper to avoid sticking. You could instead lightly grease the baking paper by spraying with cooking oil. It is also important to roll quickly and lightly with a floured rolling pin. 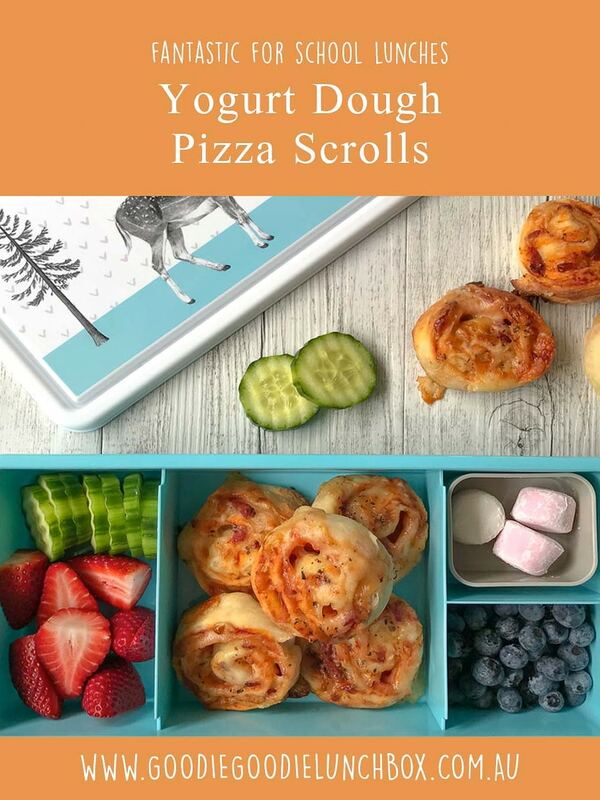 I am sure that your kids would love these Yogurt Dough Pizza Scrolls for school lunches! So round up your kids and get them helping you in the kitchen. 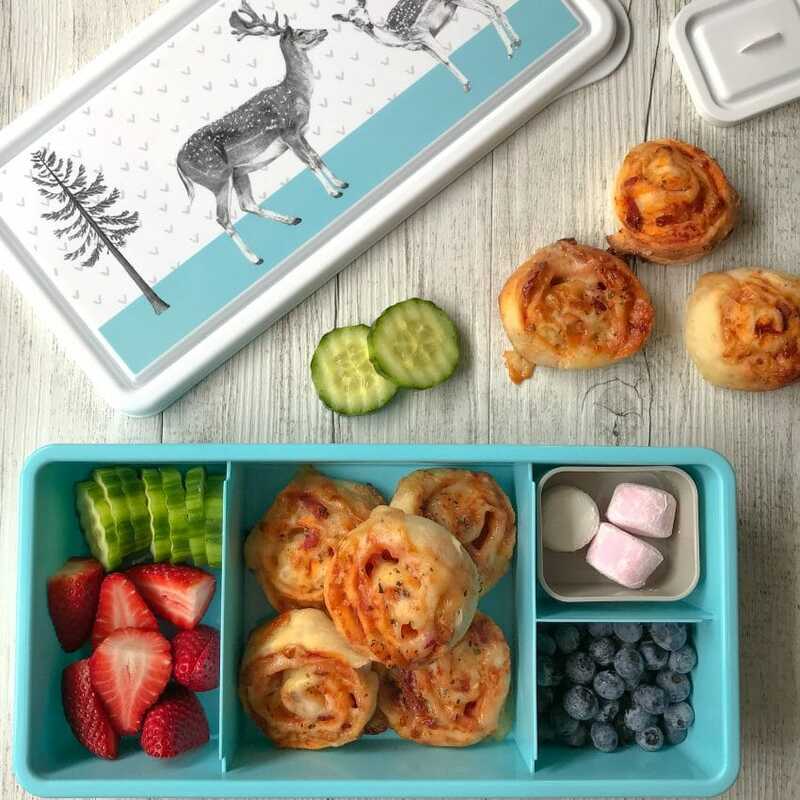 If you are looking for other alternatives to sandwiches, check out these great lunchbox ideas Pizza Topped English Muffins, Zucchini Pea and Ricotta Slice or these Cheese & Vegetable Lunchbox Muffins. 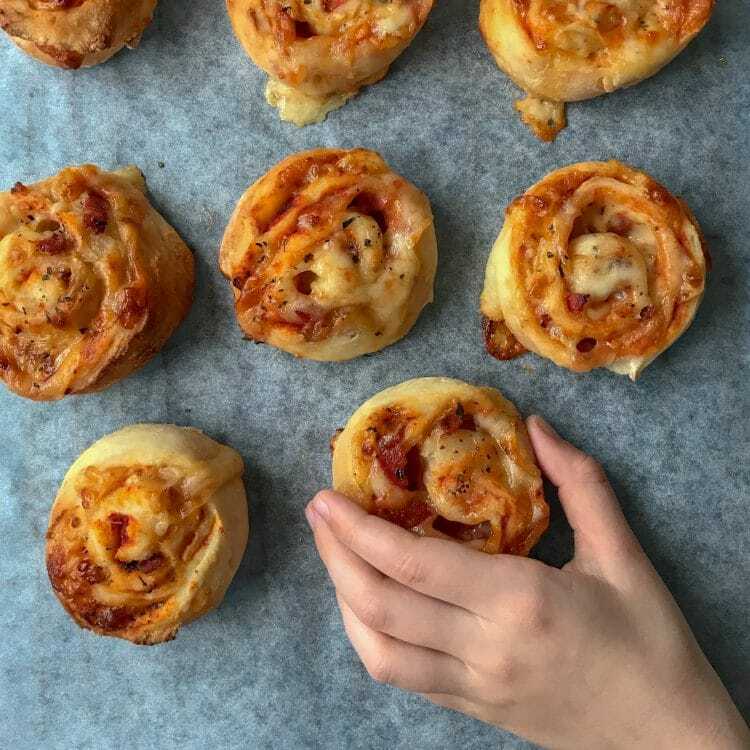 I would love to see pics of you making these pizza scrolls, so get social with me, tag me @goodiegoodielunchbox on Insta or head over to my Facebook group and share your lunchboxes with our community! These look amazing but we have a dairy intolerance in our house. Any dairy free ideas? Do you on a piece of baking paper ( as opposed to powder) when talking about rolling it out? These look amazing. Can they be frozen? I made these and they were a huge hit! I cook a lot but never made pizza before. I was always scared of the dough. This dough was so easy and so simple. I am literally going to unfollow the other sites because non of their recipes work. Yours is always a hit. Thank you!! I have tired to make this dough and it was really sticky.i bad to add more than 1/2 cup of extra flour. I used my kitchen aid to make the dough could it be the explanation? Shall I cut down the quantity of yoghurt a bit? Hi Bernadette, do you think I could add pureed spinach to the dough to give it a veggie boost? Not sure if it would upset the dough. Gotta get some greens into my son! I found the dough super sticky. The first sheet got stuck to the baking paper and was a nightmare to get off (I couldn’t reroll it as I had already put on the topping). Added over 1/2 a cup of flour to 2nd half and worked much better.